A bath remodel in your home can be both challenging and extremely satisfying. Whether it’s remodeling a small powder bathroom in the entry, a master bathroom suite, or bathroom remodeling for your adjoining kids’ rooms, the renovation project needs to address your lifestyle, personal needs, and enhance your home’s design style. Hire the top bathroom remodel contractor in the North Dallas area. 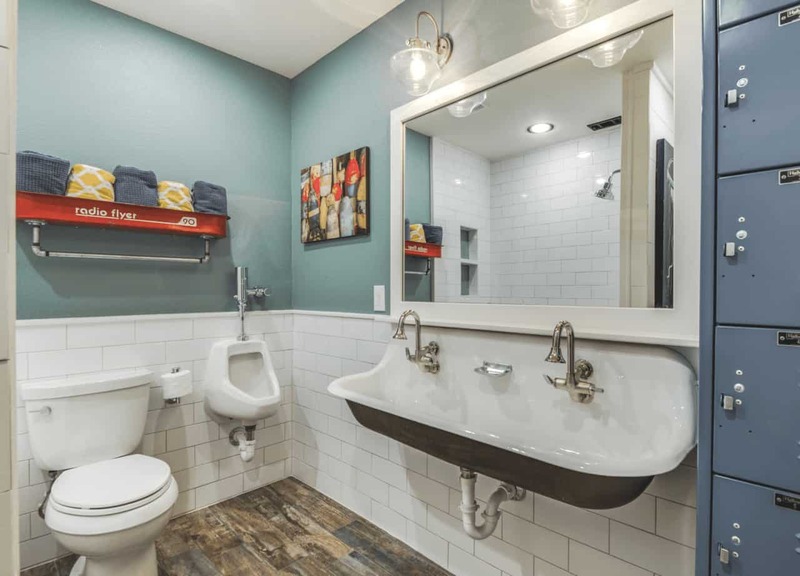 When considering a bathroom remodeling project, it’s important to think about who uses the space, the personal needs of the user, function and practicality, design style and budget. 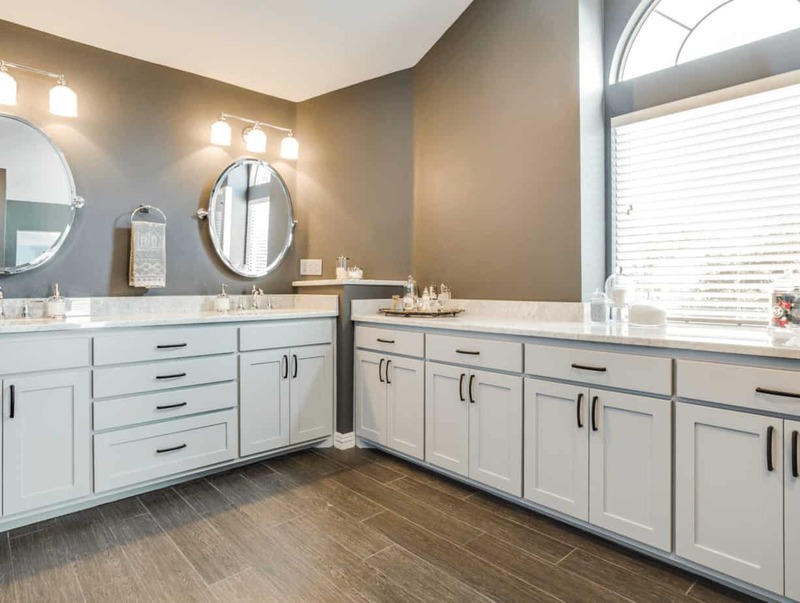 With so many beautiful and innovative fixtures and materials available, bathroom remodeling selections and the associated prices can become overwhelming. It’ll likely be important to narrow down your choices. 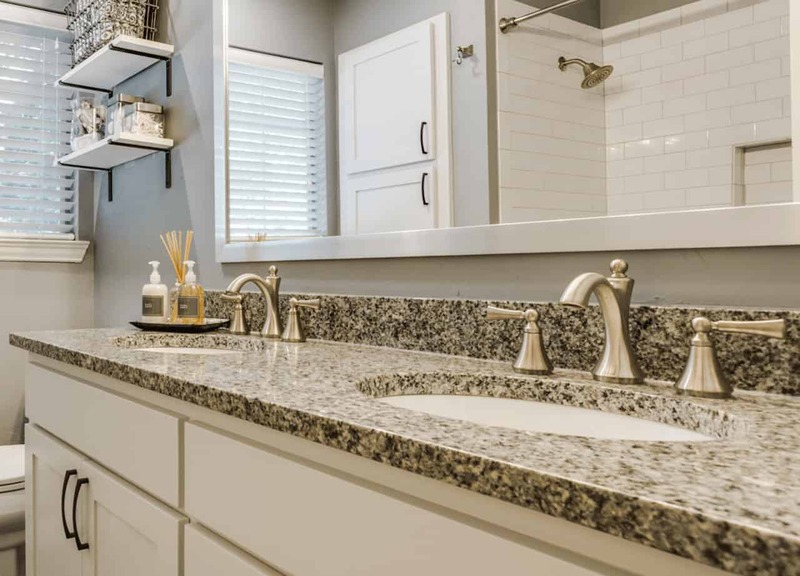 A bathroom remodel in North Dallas can typically average from $15,000 to $50,000 and beyond, depending on your material and fixture choices, so you want to get it right. Read more about Things to Consider When Remodeling a Bathroom. Warmth on the walls: Consider wood-look ceramic tile for bathroom walls and shower areas for a warm and inviting texture. Before you begin a bath remodel, determine your design style. The fixtures, flooring and countertop materials, as well as colors and accessories should complement the space and blend with the rest of your home. You don’t have to match colors and materials in other rooms, but you should keep them in mind to create design continuity throughout the house. For instance, if all of your door knobs and hardware throughout the house are brass, don’t choose chrome fixtures for the bathroom. Choose brass or a complementary finish like bronze that’s in the same color family. As any interior designer will tell you, “ for great design, pay attention to the details.” Even the smallest details can make or break the design appeal of a room. If your home is filled with traditional furnishings and old-world antiques, your bathroom remodel should follow that same style. On the other hand, if your home is contemporary with sleek, modern furnishings and accessories, stay with that same style in the bathroom. Don’t try to make a design statement in your bathroom that doesn’t follow the style in the rest of the house. Your bathroom remodel with look like an afterthought, rather than a well-planned design project. Once you determine your design style, you can get a lot of great ideas for your bathroom makeover by looking through design magazines, online design sites, and visiting bath and plumbing showrooms in your area. These are great ways to see current bathroom design trends and new fixtures and materials that are available. Today, bathroom design has evolved to a new level of luxury. Bathrooms, once simple utilitarian spaces, now resemble plush spas with relaxing ambiance and rejuvenating features. Homeowners want bathrooms, especially master bathrooms, where they can unwind from a long day and relax in the height of luxury. Stylish free-standing vanities have replaced built-in cabinets with old-fashioned, utilitarian appeal. You’ll find traditional vanities that resemble antiques and modern vanities with sleek, contemporary features. Exquisite wood, painted and lacquered finishes and innovative, energy-efficient fixtures add luxurious appeal. Free-standing vanities come with single and double sinks in a variety of styles with drawers and storage or raised legs that create an airy, open space. Soaking tubs provide spa-like features that are extremely popular with today’s homeowners. Tubs come in modern, free-standing styles, as well as built-in and sunken styles that complement any bathroom design and decor. Sunken tubs, when bordered by flooring materials, resemble a floating pool of water that creates a unique bathroom feature. Soaking tubs are equipped with various controls and water jets to enhance the full spa treatment. Today’s top bathroom remodel contractor knows that bathrooms include modern-style rain showers to offer a zen-like experience. Shower remodeling often includes shower heads with multiple water functions; overhead shower heads; hand held shower heads; body sprays; rain bars; and comfortable platforms or ledges to sit down and relax. 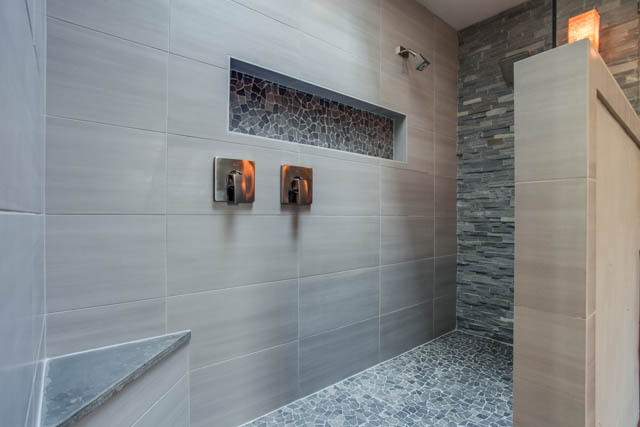 Many of our shower remodels also include built-in soap and shampoo dispensers, LED lighting that changes colors, and built-in music systems for the ultimate in shower luxury. The materials you choose for the floor, walls, and countertops will have a big impact on your bathroom’s design appeal and budget. Whether your bathroom is large or small, it’s important to choose materials that complement your design style and other features in the space. Thinking about your kitchen too? Visit our Kitchen Remodeling page. There’s a variety of material choices in natural stones, ceramic, and porcelain tiles that work well for bathroom floors. When selecting a bathroom flooring material, emphasis should be on safety to prevent falls and materials that are easy to clean and maintain. Make sure flooring materials provide a slip-resistant surface and easy maintenance requirements. Bathrooms stay wet or damp much of the time, so moisture settles onto numerous surfaces. Walls and ceilings accumulate moisture which often leads to mold and mildew, especially in showers. Glazed tiles and polished stone finishes are best for walls, because they don’t absorb moisture and they are easy to clean. If you use individual tiles with grout, a sealer will protect the grout from building up mold and mildew, a common bathroom problem. Of all the simple ways to update your bathroom, mirrors and lighting can have the most dramatic effect. Simply changing the size, shape, location, or number of mirrors in the bathroom can make a small room appear larger or reflect other decorative qualities. Adding more lighting or a dimmer switch will drastically change the mood of the room, as will switching from fluorescent lighting to recessed lighting. You can also consider adding natural light through windows, or for an interior bathroom through a skylight. Swapping out the sink faucet or shower head is an easy way to improve the look of any bathroom in a cost-effective way. Depending on the age and condition of the current fixture, you may also end up improving the water pressure. Any home improvement store near you will offer a wide range of fixtures, ensuring that you’ll find something to fit the style of your bathroom. Thinking of other home improvement projects like a kitchen, or room addition? Find out about some of our other specialties on our home remodeling page. Ready for your very own bath remodeling experience? Hire the best bathroom remodel contractor in North Dallas. Schedule a visit to showroom today or contact us to schedule your in-home bathroom renovation estimate!